Nsemia Inc. Publishers has offices both in Kenya and Canada. We focus on African-based artistic creation and how they impact African peoples on the continent and in the Diaspora. We aim at bringing to the fore the many untold stories that enrich African lives; stories that have a bearing on Africans and their contribution to the global village. 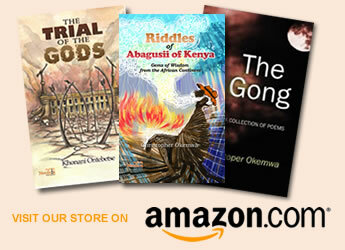 If you have written an African-related story, the chance is that we will publish it. It could be a play, a collection of poetry, drama, a novel, a musical or any such form of artistic creation that captures imagination, entertains and teaches a lesson. What we offer is insightful guidance in the processes of writing, editing and (eventually) publication. We also offer advisory services pertaining to publishing. If you need help with writing, we offer coaching and ghost writing as well. 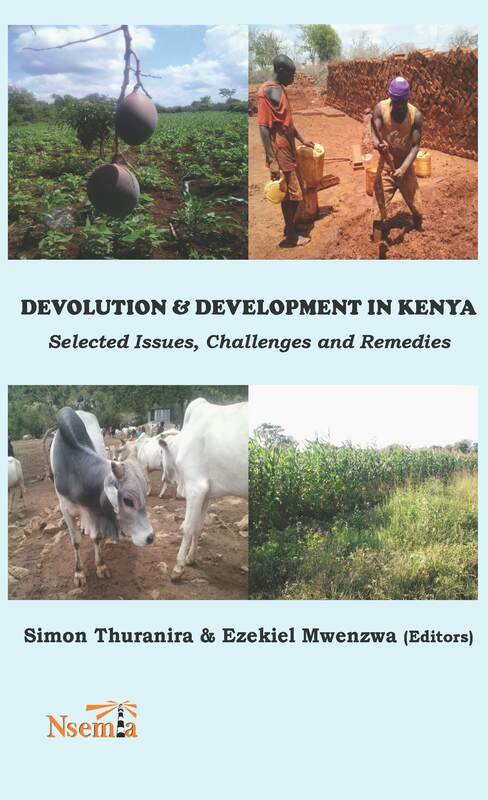 Nsemia Inc. Publishers announces the publication Devolution and Development in Kenya: Selected Issues, Challenges and Remedies edited by Simon Thuranira and Ezekiel Mwenzwa. Post-independent Kenya’s development-related debates evoke issues of equitable distribution of resources for all citizens across the country. Past efforts such as the District Focus for Rural Development of the 1980s recognized the need to have development priorities based on local needs. The Constitution of Kenya (2010) devolved services and development, with the creation of the county governments’ structure which are guided by the principles of equity. Debates and discussions continue on the true impact of devolution and whether or not it has realized its mandate in terms of development as intended by the constitution. Scholars in this book explore this subject and provide insights on the real impact of devolution. Simon Thuranira Taaliu is an Associate Professor of International Education Policy. He has a Doctor of Philosophy from the University of Maryland (USA), Master of Education and Bachelor of Education both from Kenyatta University (Kenya). He has over 20 years of experience in teaching, research and administration at the university level. His areas of research and specialization include Educational Leadership and Management, International and Comparative Education and Teacher Education. He has served as Chairman of the Education Department at Kenya Methodist University (Kenya), and taught at the University of Maryland (USA) and Indiana-Purdue University (USA). He has also been a consultant at the International Reading Association and at US-Africa Initiative on Higher Education, both in Washington DC (USA). Currently, he is the Chairman of the Department of Education and Social Sciences at the University of Embu, a former Constituent College of the University of Nairobi (Kenya). He was a visiting Professor at Purdue University (USA) in 2017. Ezekiel Mbitha Mwenzwa holds a BA (Social Work) and MA (Sociology) from the University of Nairobi (Kenya). Currently, he is a doctoral candidate at the University of Eldoret (Kenya) where he specializes in Applied Environmental Social Sciences. He is also a member of faculty at Karatina University (Kenya) where he teaches courses in Sociology and Community Development. His areas of research include Gender, Dryland Development, Natural Resource Management and Rural Development. He has over forty (40) publications in edited books and journals particularly on Dryland Development. His most recent publication is Public Policy Transformation in Africa: Trends, Challenges and the Future, co-edited with Enna Gudhlanga and Joseph Misati (2016).